SUMMER DAY CAMP REGISTRATION IS OPEN!! SUMMER CAMP RUNS JUNE 17TH THROUGH AUGUST 23RD. Your camper's spot won't be reserved until we've received payment, and your annual family membership is up-to-date. 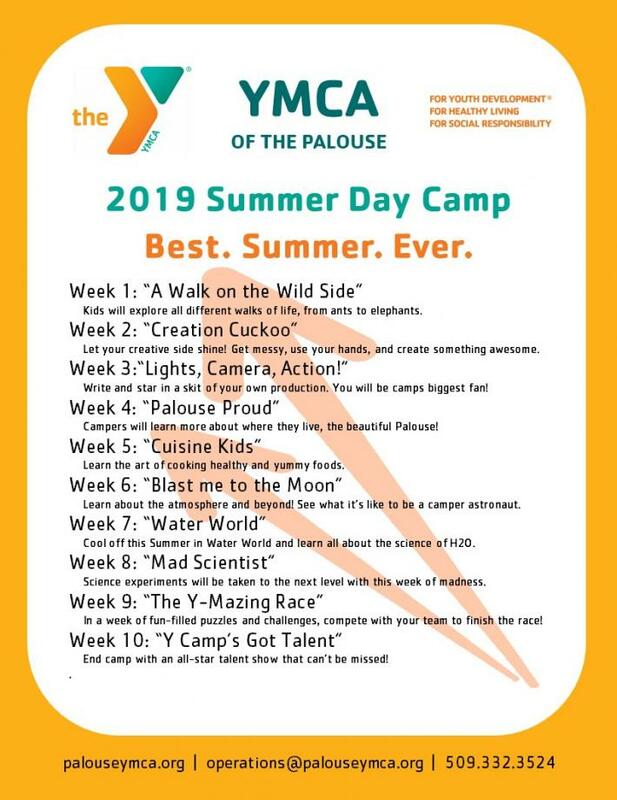 Registrations and payments for summer camp can be made online, over the phone at (509) 332-3524, in person at the Y office, or mailed to us at 105 NE Spring St. Pullman, WA 99163. A 15% discount is offered for full-summer enrollment until June 14th, and 10% discounts are available for monthly enrollment, as well as early registration for weekly enrollment, due May 17th (both registration and payment are required). Our day camp offers experiences to help your child explore their personal interests, build self-esteem, develop interpersonal skills, discover the outdoors and make lasting friendships and camp memories. Our Summer Day Camp is designed to keep your child's brain in high gear by incorporating summer learning while providing a fun and exciting day camp experience! The program provides ample opportunities for kids to actively engage in the world around them and their community. Our camp is values-driven, which means we emphasize core values in all of our activities, adhere to the Y's Healthy Eating and Physical Activity standards, and focus on key development areas, particularly working to combat summer learning loss. One area that we emphasize is continued literacy development through our “Y Camp Readers” program that ensures children read for a minimum of a ½ hour every day in our camp. Over the course of the summer of 2017, this translated into over 2,000 hours of reading in 10 short weeks! Our camp is held Monday - Friday from 8:00 am to 5:00 pm at Sunnyside Elementary School. See pricing structure below. At the Y, we believe quality programs begin with quality staff. That's why our camp is staffed with people who have a background and experience that helps them understand the cognitive, physical and social development of children. Our staff is made up of a group of cause-driven counselors and administrative staff focused on three key areas: youth development, healthy living, and social responsibility. We believe a strong community can only be achieved when we invest in our kids, our health, and our neighbors. Our programs, services, and initiatives enable youth to realize their potential, offer families ways to have fun together, empower people to be healthier in mind, and body, welcome and embrace newcomers and help foster social responsibility. Our staff maintains children in a safe environment, keeping them connected and supported in trying new things as well as demonstrating a caring nature and using positive reinforcement. Our programs align with HEPA standards (healthy eating and physical activity) where the Y focuses on healthy food options, physical activities, limited screen time and offers information to families about healthy lifestyle choices. Snack is served family-style so that participants can learn responsibility when it comes to eating habits and develops the interactive social skills necessary for a shared dining experience. Campers bring their own cold lunch, and Subway sandwiches are also available for purchase during check-in. The Y offers healthy, nutritious free breakfasts and lunches to children who qualify for free and reduced-price lunches during the school year. Please see our Y Meal Program page for more information. Each group has a site phone at all times so families can always get in touch with their child's group, no matter what fun adventure they might be on! At the Y, we believe families should be in the know. Our staff send out weekly schedules so families can plan ahead and rest assured knowing where their camper is at all times. Campers go on field trips most days, often based on our weekly themes: Swimming at Reaney Park Pool twice a week and on Fridays, we have a camp-wide party, when campers have the opportunity to participate in competitions, fun recreational activities, and the campers-of-the-week gets to "Pie the Y," an opportunity to pie a camp counselor in the face! Every week, campers engage in service learning opportunities, which incorporate our focus on social responsibility. We encourage all of our participants to become involved members of the Palouse community. These opportunities have ranged from volunteering at animal sanctuaries, farming, parks clean-ups, and visiting local senior citizens. The Y makes accessible the support and opportunities that empower people and communities to learn, grow and thrive. With a focus on youth development, healthy living, and social responsibility, the Y nurtures the potential of every youth, improves the nation’s health and well-being, and provides opportunities to give back and support neighbors. We are able to offer this through our Financial Assistance program. Financial Assistance is provided to individuals, children, and families on a need basis and allows access to the programs the Y offers. Anyone is eligible to apply for Financial Assistance and awards are based on a sliding scale that considers household size and income. To apply, please see our Financial Assistance page for more information.